If you are in a jam, these covert self defense ink pens can make the difference. 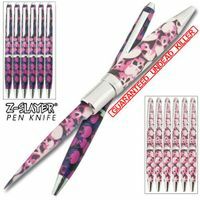 A real ballpoint pen hides a very sharp 2.25 inch knife blade made of stainless steel. Just pull off the cover to expose the blade. The standard knife pen model comes in black, silver, gold. The black and silver models are individually packaged. This is a is a slim-design knife pen which helps disguise its dual purpose. Also makes a great utility knife or letter opener. 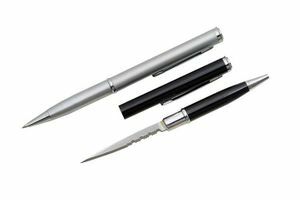 Buy 3 knife pens for only $3.83 each. As little as $3.65 each when you buy 6. These are very handy to have around, but be careful they are sharp with an extreme point. Great for opening letters or cutting coupons from the paper or can help you defend yourself in an emergency. Our Knife Pens are individually packaged. A very useful tool that doubles as a self defense weapon. What if you are doing inventory in the warehouse or walking out to your car at night in a dark parking lot. Now you wish you had one of these inexpensive knife pens in your hand. Don't wait 'til its too late, get some now for yourself and your loved ones. Gold model is not serrated, but has a smooth blade edge. Not available for sale to CA. It is your responsibility to know and understand the laws of the state and municipalities you are located in. The blade is sharp and wonderful, and it got here literally a week after I ordered it. Love this. Good for protection. Let's see if anyone wants my wallet now. Decent little knife for the price. Not expecting much from a blade this size, but good to have in a pinch. Pen actually writes decently, too. The product was exactly what I expected I'm satisfied. Just ordered more. I give to my friends. Thinking of buying more to give as gifts.